The Colón Laboratory wanted to say a belated congratulations to three of our members who have successfully defended their Ph.D. degrees in the past year! Jennifer Church, Jayeeta Sen, and Hannah Trasatti all walked at the RPI Commencement Ceremony this spring and recently started jobs in industry. Congratulations Doctors! 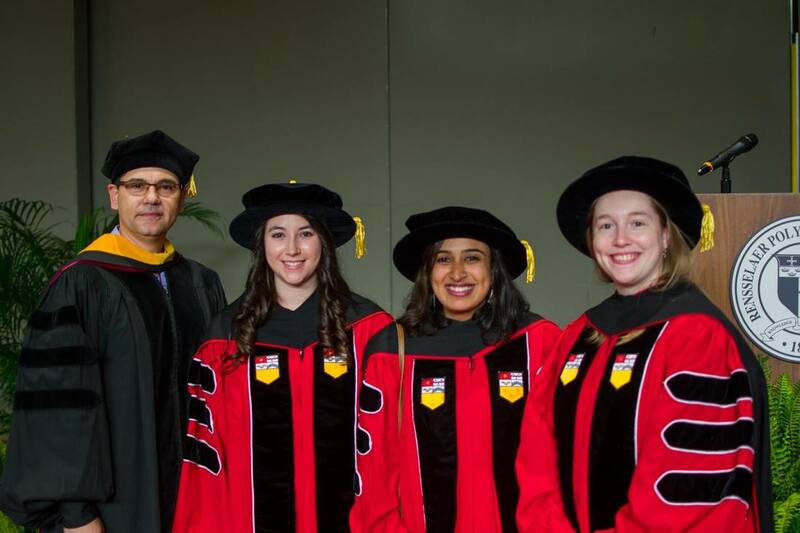 Wilfredo Colón celebrates the graduation of three doctoral students from his lab, Hannah Trasatti, Jayeeta Sen, and Jennifer Church (left to right), at the RPI Spring 2018 Commencement Ceremony. 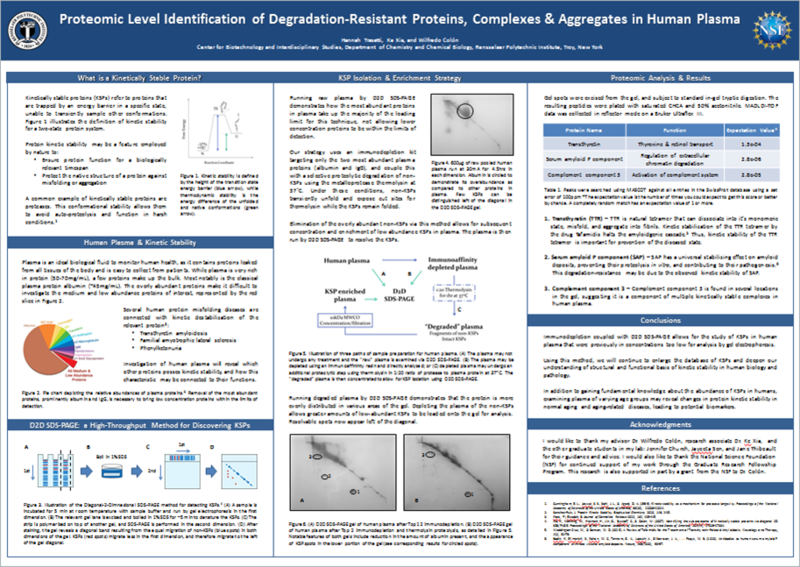 Lab member Hannah just returned from U.S. HUPO conference in Boston, MA. The conference was held at the Westin Boston Waterfront from March 13-16th. While at the conference, Hannah presented a poster highlighting her work identifying kinetically stable proteins and complexes in human plasma (see below), and gave a two minute "lightning talk" on the main stage. Hannah also took a short course entitled "Stable and Transient Protein-Protein Interactions taught be Ileana Cristea from Princeton University and Alexey Nesvizhskii from University of Michigan. Lab members Jennifer Church, Jayeeta Sen and Hannah Trasatti attended the annual NIH Training Grant Retreat hosted at Pat's Barn in the Rensselaer Technology Park. The day began at 9:00am with a light breakfast of fruit and bagels, followed by an opening by CBIS Director Deepak Vashishth about how he plans to expand the NIH Training Grant to encompass more graduate students. The three new fellows Katherine Mezic, Nicholas Vecchiarello and Josephine LoRicco gave brief presentations about their research projects. An industry speaker from the Albany Molecular Research Institute spoke about being successful in a long term career position, contrasted by the Dean of the School of Science Dr. Curt Breneman who spoke about being getting tenure as a professor. A barbeque lunch was served at 12:00pm, followed by a poster session. Hannah presented a poster about kinetically stable proteins in human plasma. The last activity of the day was three breakout sessions: one discussing the Microbiome with Dr. Blanca Barquera, one discussing Stem Cell Engineering with CBIS Stem Cell Core Director Brigitte Arduini and Dr. Deanna Thompson, and one discussing Academia/Industry Collaboration with Dr. Peter Tessier. The Colón Laboratory is happy to welcome four new members this semester. We have one exchange student Kathrin Troelk from the Technical University of Denmark. She will be working with Hannah researching kinetically stable proteins in human plasma. Two new graduate students in the Department of Chemistry and Chemical Biology, Taylor Sweet and Joe Bromley, will be spending one month observing the members of the lab as part of their rotations, and visiting professor Daryl K. Eggers from San Jose State University. Welcome everyone! Members of the Colón Lab gathered for a fun summer day at Grafton Lakes State Park, located about 25 minutes from RPI. We had a great day playing games in the sand, and even had our own picnic!